This is just a fancy name for a beef stew cooked in wine. A light to medium bodied, young red wine is ideal. Such as a Pinot Noir or a Cote du Rhone. One thing you want to remember while cooking this dish is to not rush it by turning the temperature up too high in order to get it to cook faster. If you do that, your meat will be tough and nobody will want to eat it. That’s what she said. Sorry, that was necessary. The quantities in this recipe will provide enough food for a dinner of four, with some leftovers. We will be using a 3 pound roast, you can use chuck roast, london broil, or any other tough cut of meat, cut into 2 inch cubes. 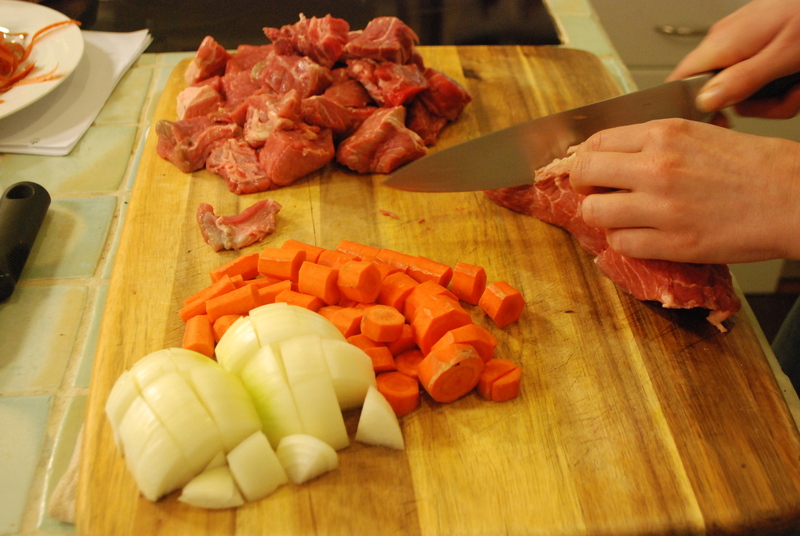 To ensure even cooking for all of your meat you want your cubes to be as similar in size as possible. Coarsely chop one yellow onion and approximately five medium-size carrots. Be sure to peel your carrots before you dice them. Make a bouquet garni to throw in the stew, wrap six parsley stems, 10 crushed black peppercorns, one Bayleaf, and a few sprigs of thyme in cheesecloth or a large tea ball. Then again, if you use your tea ball, all of your future teas may be quite meaty. When it comes to browning the meat, it is best to use a Dutch Oven that is safe for stovetop use, but you can also use a deep skillet. Put over medium-high heat and add 1-2 tbsp oil when the pan is heated. Give the cubes of meat a generous dusting (don’t be shy) with salt and pepper prior to browning. 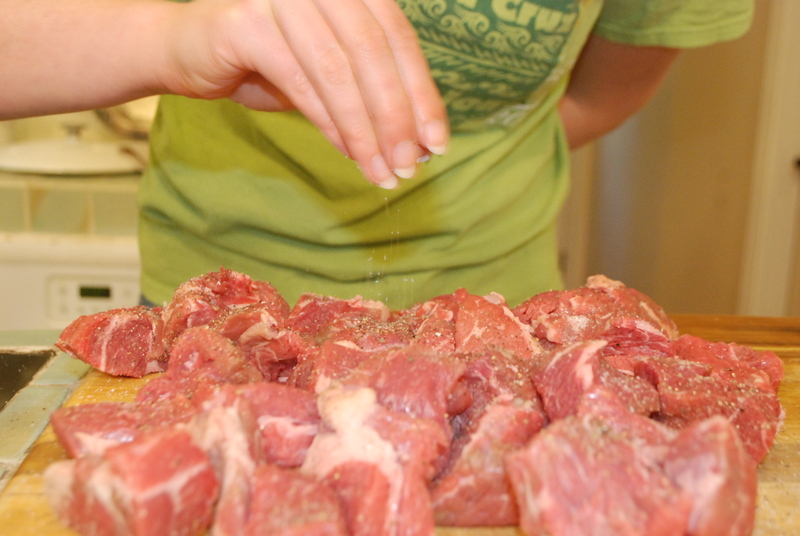 Salting the meat too long before browning will draw out the moisture and leave your meat dry. Add the meat to a nearly smoking-hot pan, being sure to only add enough to create one layer. Our goal here is to brown at least two sides of the meat, without cooking the meat all of the way through. Hot, fast heat! Otherwise you could end up with the aforementioned tough meat (that nobody will want to eat). It will probably be necessary to brown the cubes of meat in multiple batches. Next, add your chopped onion and chopped carrots. When they’re nearly ready, add the chopped garlic, sauté for a minute or two, then add a tbsp of tomato paste. Give all of that about two minutes in the pan, then deglaze with whatever wine you have chosen to make your delicious meal with. To deglaze, pour a half cup or so at a time and gently scrape the bottom of the pan with a plastic or wooden spatula. The liquid, wine in this case, will help to easily break up those delicious, caramely, little flavor bits. Once you’ve got all of the fond (delicious flavor bits) off the pan and in your sauce, add the meat back in. 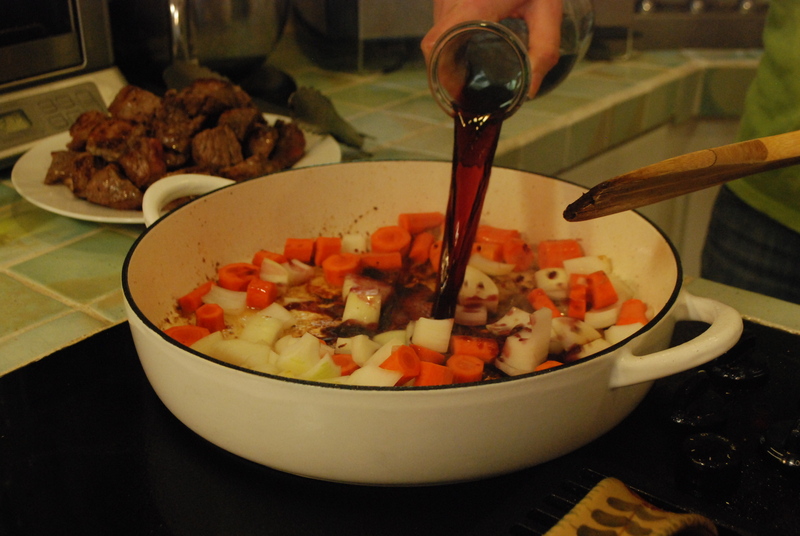 Fill pan with more wine and beef stock, to cover the meat. At this point maybe you’ve been intuitive enough to know, magically, to preheat your oven to 300°F. 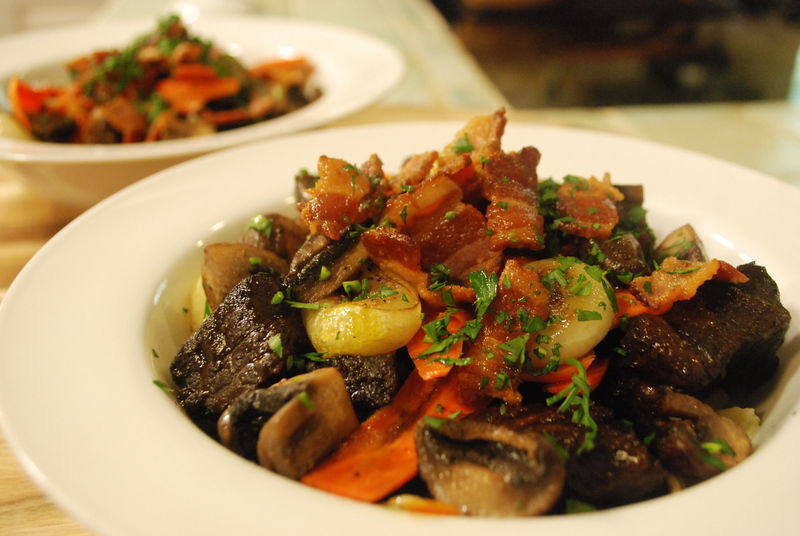 If not, no worries, the pan of meat and vegetables can rest while your oven preheats. Stick it in for about 3 hours. Give it a check every half hour, to be sure you are not killing your masterpiece. Be sure that the liquid stays above your meat and veggies, unless, of course, you like jerky-stew. While you are waiting, you can prep all other ingredients. Halve or quarter your crimini or baby portabella mushrooms, cut the ends off and peel your pearl onions, prepare your baby carrots, or use full size carrots by peeling, then slicing lengthwise. 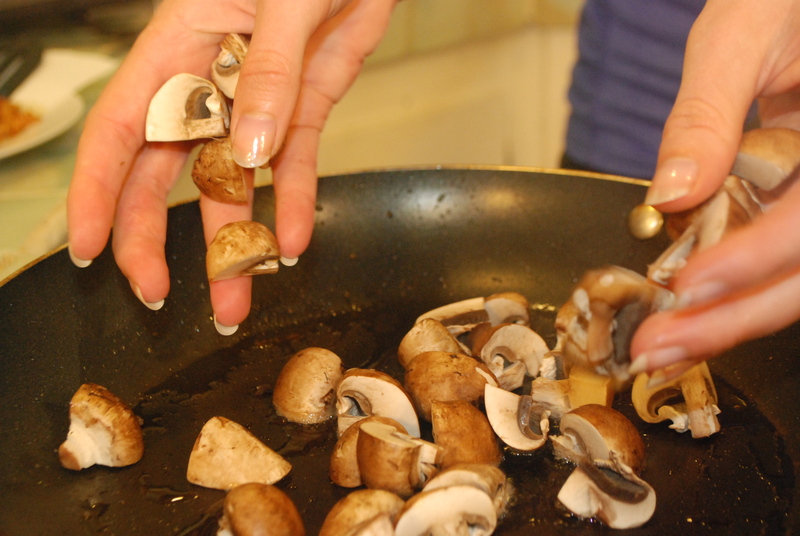 Think of Julia child’s advice when you sauté your mushrooms, be sure not to crowd your pan, otherwise your mushrooms will not brown, as desired. 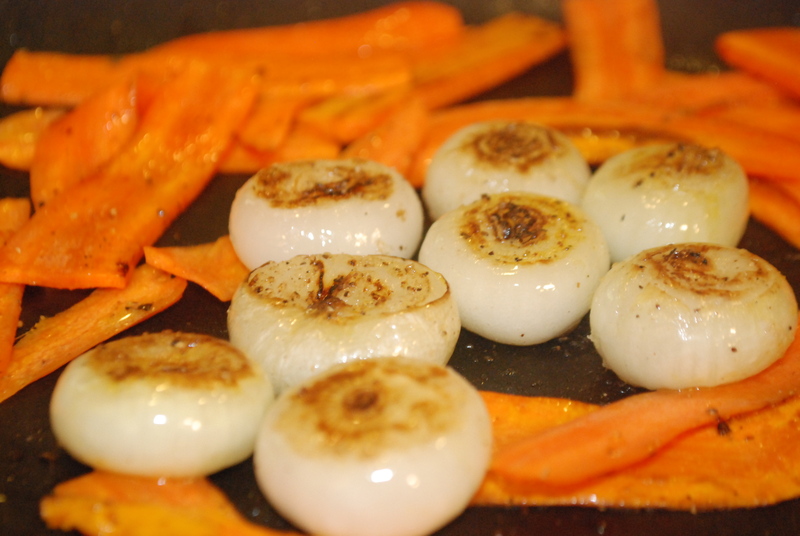 Next, sauté the pearl onions, then the carrots. Click here for an in depth lesson on browning without burning. It may just be the most important principle of cooking, ever, in the whole world. 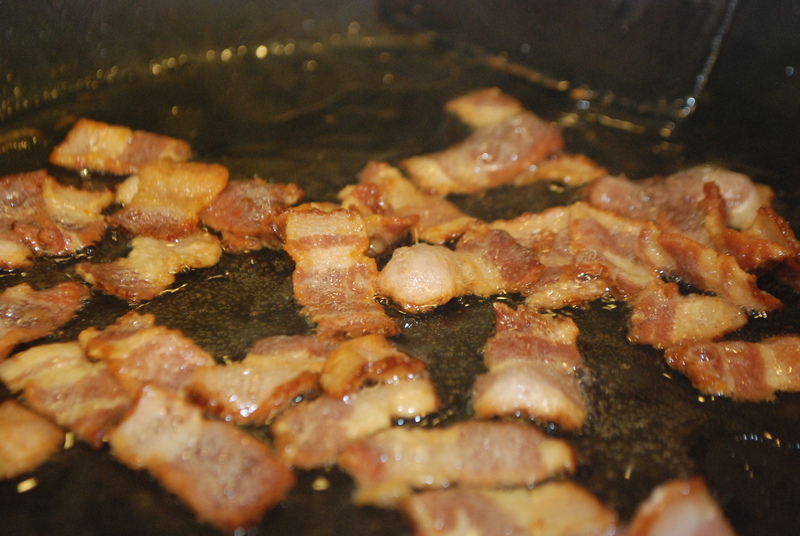 Oops, oh yeah, you should have chopped and cooked your bacon by this point too. Set all these ingredients aside in covered dishes to keep warm until the dish is served. The meat is done when it is tender enough to pull apart with a fork. 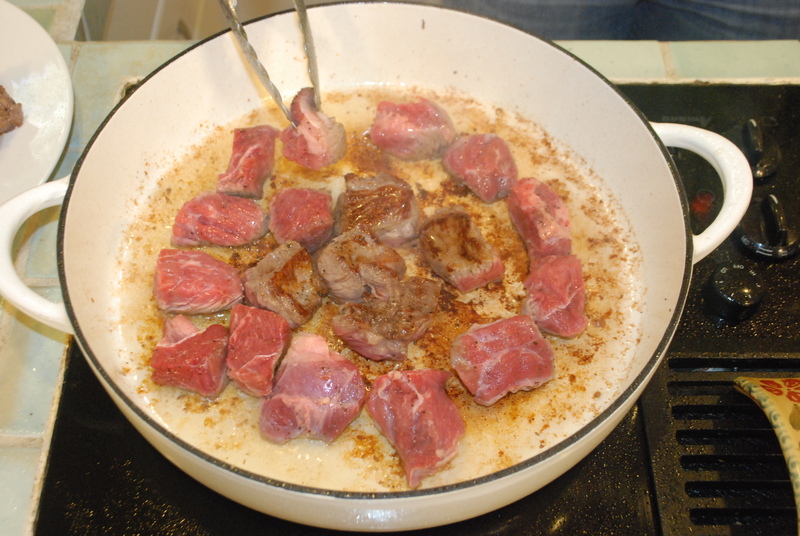 Remove the cubes and strain the sauce into a pan to reduce. It should be thick enough to coat noodles and such. Looks amazing and it was!! Thank you for having us over! Thank you! I’m so glad you made it over. Can’t wait for the next dinner party!